Genetic counsellors are health professionals with specialized training and experience in the areas of medical genetics and counselling. Genetic counsellors work as members of a healthcare team, providing individuals and families with information on the nature, inheritance, and implications of genetic disorders to help them make informed medical and personal decisions. 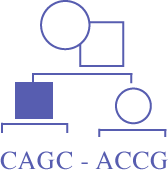 Genetic counsellors identify individuals and/or families who may have or be at risk for a genetic condition, investigate the problem present in the family, interpret information about the disorder, analyze inheritance patterns and risks of occurrence or recurrence, and review available options with the individual/family in a manner that promotes informed choice. Genetic counsellors help people understand and adapt to the medical, psychological, and familial implications of how genetics contributes to disease. In addition to the roles described above genetic counsellors guide individuals/families in discussions about test result interpretation, prevention, medical management and options for prenatal diagnosis. Genetic counsellors also provide supportive counselling to individuals/families with sensitivity to ethnic and cultural diversity and they address potential ethical issues. Furthermore, they serve as patient advocates and refer individuals and families to available support services. Genetic counsellors serve as educators and resource people for other healthcare professionals and for the general public. Increasingly, genetic counsellors are working in non-traditional roles within both public and private health related institutions. These roles include administration, marketing, consulting, and activities related to research in the field of medical genetics and genetic counselling. Interested in a career in genetic counselling?